I used to think that the gin and tonic was a simple drink. I mean, how hard could it be to fill a glass with ice, add a couple measures of gin, and then pour tonic water over it? Then I visited a speciality gin bar in Spain a couple of years ago, and was blown away by just how seriously the Spanish took the humble gin and tonic. First of all, the bar’s gin menu consisted of over 200 gins, ranging from standard London dry gins and traditional Dutch-style genevers, to the more exotic, premium gins that seem to contain an entire garden of botanicals. Next, came the tonic waters. You might think that tonic water is just tonic water, but these days, the number of different tonic waters can be mind-boggling, with the usual commercial brands like Schweppes competing with more premium ones like East Imperial, and Fever Tree. And then, last but not least, were the garnishes. Besides the standard wedges of lime, I also got to choose from a range of different botanicals, including fresh juniper berries, cucumbers, rose petals, cinnamon, star anise… all of which are supposed to complement the gin that is in your drink. When the drink came, I was also surprised to see it being served in a large balloon glass, much like the ones used to drink wine or cognac, and a dash of bitters. Since then, I’ve learnt that this sort of gin and tonic is known as the Spanish-styled “gin tonic”, and it has completely changed the way the humble gin and tonic is being perceived worldwide. Roberto Gonzales said that the tonic water should be poured using a bar spoon to ensure the bubbles don’t dissipate too quickly in the glass. The gin and tonic was first created in the 1700s by soldiers in the British East India Company army stationed in India who were given quinine, a drug used to treat or prevent malaria. Since the quinine tastes terrible on its own, the soldiers made tonic water out of it by mixing it with water, sugar and lime … and of course, some gin. According to Spanish bar consultant Roberto Gonzales, CEO of In2bar Bar Consultancy in Spain, the rise of the gin and tonic in Spain is a fairly recent occurrence. “When I was young, I remember that only older people over 45 years old drank gin and tonics. Young people never drank it!” he recalled. 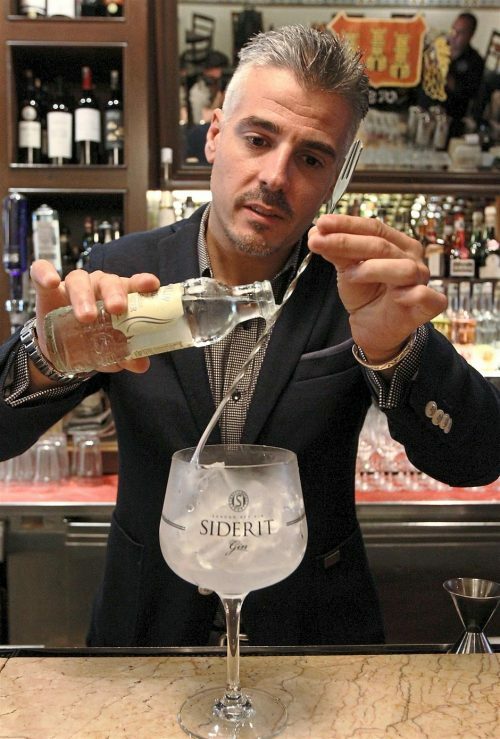 Gonzales was in town recently to promote Spanish gin brands Siderit Gin and Gin Mare. The rise of the Spanish gin tonic is attributed to The Best of Gastronomy summits organised by journalist Rafael García Santos held in San Sebastián between 1999 and 2009. An article by Forbes magazine explains that the summits brought together elite chefs to exchange ideas, and every night after the day’s programme, Santos and the chefs would go to a certain bar in the city where the gin and tonics were “sensational”, and soon, word got out that off duty chefs preferred gin and tonics as their off-duty beverage. According to Gonzales, there are a few elements that are required to make a good Spanish gin tonic. First, is the glass. “Gin and tonics used to be just served in a Tom Collins glass filled with ice cubes. Then, people started changing to the cider glass, which is something similar to a whisky tumbler. Then the balloon glass came in, which allows you to smell the aromas of the botanicals and the gin better,” he said. You also need a good quality ice – if the ice is of poor quality, then it might melt too fast and dilute the drink too quickly. And of course, the next thing one needs for a good gin tonic, is of course, a good gin and a good tonic. “If you want a good gin tonic, then the gin and tonic has to be good quality,” he said, adding that a cheap gin doesn’t necessarily have to be bad, but some can be really low quality. The same goes for the tonic water, one should always choose a good product, preferably one that retains its bubbles for a longer time. 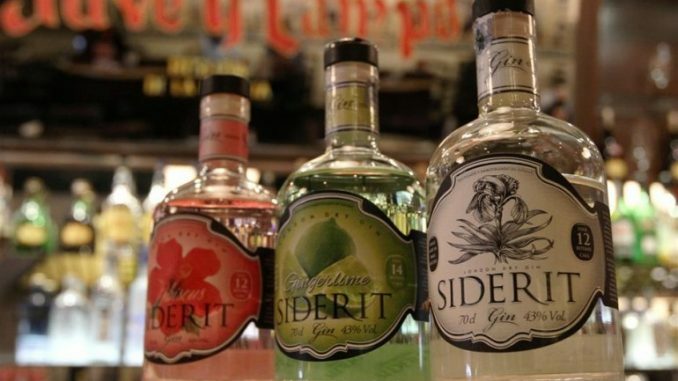 According to him, Siderit Dry Gin is a Spanish gin made in the style of a London Dry Gin. Produced in Cantabria, Spain by Destileria Siderit, it is a small batch gin made from rye and 12 botanicals, including juniper, coriander, rock tea, cardamom, angelica root, cinnamon, bitter orange peel, mandarin peel, hibiscus, pink pepper, raw marcona almond and iris root. The rock tea, or Sideritis hyssopifolia, is the botanical that gives Siderit its name. “It’s a little plant that grows between rocks and only grows in a certain area,” he said. Gonzales also recommends pouring the tonic into the glass slowly, using a bar spoon instead of directly from the can or bottle. This will ensure that the bubbles in the tonic don’t dissipate too quickly. Finally, last but not least, is the garnish, which Gonzales says makes a huge difference in the gin tonic. “It’s more than just to make the drink look pretty – it helps a lot to make the gin tonic taste better as well. 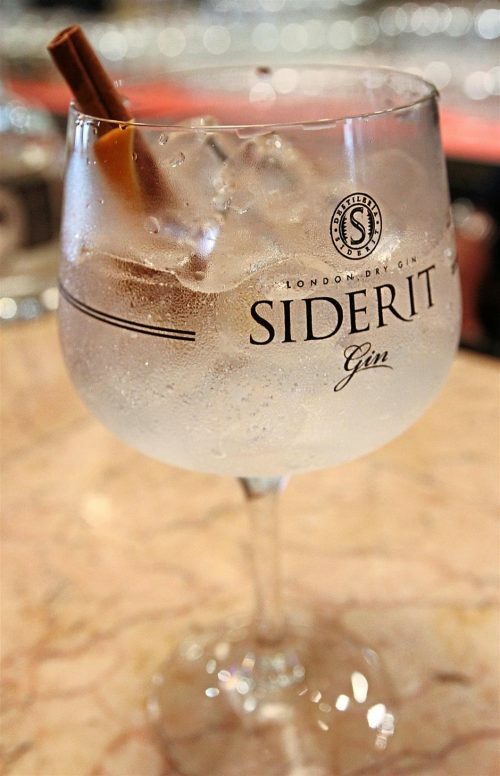 If your garnish can emphasise one of the main ingredients in the gin, for instance, like the rosemary in the Gin Mare, then the drink will be completely different,” he said, adding that for a Siderit gin tonic, the best garnish would be an orange twist, cinnamon, and juniper berries. He also says that one also shouldn’t put too many garnishes in the glass. “Sometimes people put too many things in it to make it look appealing, but it just doesn’t make sense!” he concluded.